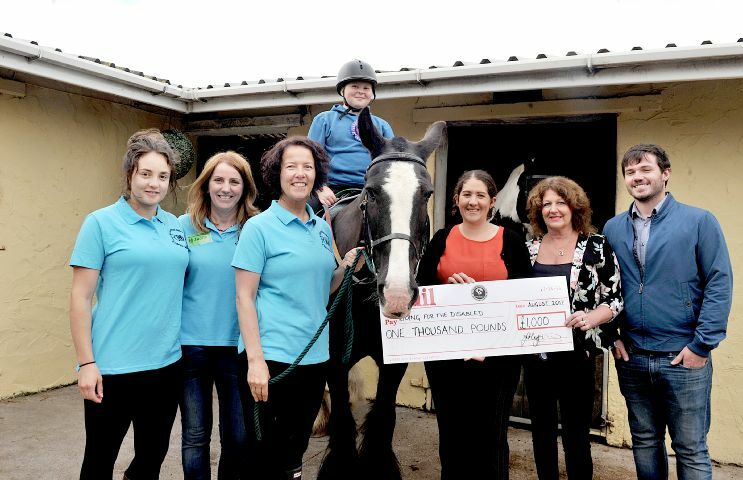 A CHARITY group which provides horse riding opportunities for children and young people with disabilities is delighted to have received a fundraising boost. Furness Group of the Riding for the Disabled Association has welcomed a £1,000 donation from the Lake District Farmers Armstrong Family Charitable Fund, via The Mail. Furness Group RDA hosts horse riding sessions for youngsters with a range of disabilities at Seaview Riding School, on Walney, during term time. These sessions provide physio, achievement, enjoyment and a chance to bond with the ponies. Pupils attend the horse riding activities on Wednesday mornings with their schools and other young people go along to the sessions on Thursday evenings with their parents. The cheque presentation took place at Furness Group RDA’s joint gymkhana with Seaview Pony Club riders. The two clubs worked in mixed teams to win prizes across a ride in the country obstacle course and equitation competition. Jack Glasgow, 11, a rider with Furness RDA, accepted the cheque along with volunteers from the group. The money was raised at the Lake District Farmers Armstrong Family Charitable Fund annual celebrity chef events, hosted and sponsored by Clarence House Country Hotel and Restaurant, Dalton. The charitable fund was founded by the late Ray Armstrong. Each month a charity or good cause benefits from the fund. Two members of the Armstrong family, Mr Armstrong’s wife Jane and son Hal, attended the RDA event and said they were impressed by the work of the charity to benefit the young people.